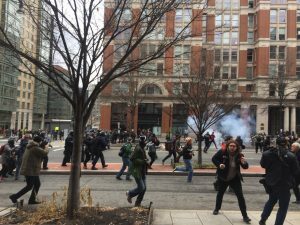 WASHINGTON — A jury on Thursday acquitted six people on charges of rioting and destruction of property connected to violent protests during President Donald Trump’s Jan. 20 inauguration. The case could have major implications for the government’s strategy for prosecuting more than 150 others charged for their actions that day. The verdict by a Washington Superior Court jury after two days of deliberations is a setback for the prosecution’s approach to the case. From the start, government prosecutors did not attempt to prove that any of the defendants had personally committed acts of violence or vandalism. Instead they argued that the entire group of protesters, many of whom wore face masks, was guilty of supporting and providing cover as others smashed windows downtown and set fire to a parked limo on K Street. The protesters are being tried in small batches in a process that is expected to extend deep into 2018. This first batch of six protesters served partially as a test case for the government’s strategy. Much of the evidence consisted of a variety of videos, from security cameras, police helicopters and, in some cases, posted to social media by the defendants themselves. Prosecutors also interviewed dozens of witnesses, but none who could identify any of the defendants as a perpetrator. The protesters are being tried in small batches in a process that is expected to extend deep into 2018. The prosecution also used video supplied to them by Project Veritas, a controversial right-wing activist collective that uses guerrilla tactics in defense of conservative causes. The Washington Post recently revealed an apparent sting operation designed to discredit the newspaper by planting a false story against Alabama Senate candidate Roy Moore. In the trial, prosecutors showed video from a pre-inauguration protest planning meeting that had been infiltrated by a Project Veritas operative. It showed organizers advising protesters on how to handle confrontations with the police, but contained no evidence of plans to commit violence or vandalism. Even before the jury began its deliberations, Judge Lynn Leibovitz seriously damaged the government’s case by throwing out the most serious charge against the six — a felony charge of inciting a riot. Leibovitz said there simply wasn’t evidence to support the charge and the jury’s verdict proved that prosecutors had failed to present convincing evidence to support even the remaining lesser charges.